When you open a new iPhone and boot it up for the first time, you’ll notice that Apple has already installed a bunch of apps for you. It’s a great idea, because it lets you use apps right out of the box. Even the newest, most confused user can tap on an app icon and start trying various things. Here’s the problem: Most users don’t replace the default apps with third-party alternatives. They mostly use the apps that came with the phone. And this is why Apple should stop making apps: The default Apple-made apps are giving iPhone users a second-rate experience. Nearly every app made by Apple for the iPhone, whether installed by default or not, should be replaced by superior alternatives. Instead of investing vast resources in the creation of apps, Apple should instead have an annual competition, then choose the very best app to be installed by default in each fundamental category. When the iPhone first shipped, Apple included a few Google apps, including YouTube and Maps. In 2007, these apps were good. Today, they’re both absolutely fantastic. But they don’t come automatically on the phone. Instead, Apple has stopped offering YouTube by default without replacing it with an alternative. And they’ve replaced the world’s best map app and service with its own shoddy version. As a result, the Android majority who stick with default apps are having a far better experience with their phones’ video and maps than the iPhone majority is. In other words, when Android users are using video and maps, they’re using a superior phone. And while the world has gotten much better at designing and creating iOS apps, Apple has gotten worse. Apple’s two most recent new apps were disasters. I’m speaking about the aforementioned Maps app, and also Podcasts. Podcasts is one of the worst pieces of …. software, Apple has ever produced. It’s got impossibly small controls, especially the one-pixel wide red line for swiping forward and back in a podcast. Sometimes podcasts simply don’t download. The app loads info on podcast subscriptions from the beginning of time. Most of the interface in one view is taken up by that dumb cartoon of the reel-to-reel tape player. It’s ugly, inconsistent and unstable. When people use Podcasts, they’re using a crappy, cheesy-looking phone. Meanwhile, Google, of all companies, has evolved into a vastly better iOS app designer than Apple. And I’m not talking about features and functions. While Apple has been producing clunky user interfaces from the 90s and upholstering them with Corinthian leather, Google has been iterating breathtakingly elegant, minimalist designs. Have you seen the new Gmail for iOS? Google+? YouTube? Google Maps? Chrome? They’re visually consistent, functional, beautiful and appealing. They are to software what the iPhone is to hardware. The trouble for Apple may be that these apps are front ends to Google services. I personally don’t have a problem with that, but if Apple wants to favor partners like Facebook and Twitter over Google+ (which it does not with an app, but with default sharing options), or favor its own services for data harvesting or ad selling (such as for Maps and Chrome) over Google alternatives, then there may be a business case for giving users inferior default apps. But other apps provided by Apple don’t even front for important services, or any services at all. Here’s an example: Apple gives iPhone users its Notes app, which is a cheesy, skeuomorphic yellow notepad-looking place to just type words and keep them on the phone. But Apple could and should replace Notes with Squarespace’s “Note” app. It’s elegant, minimalist and perfectly consistent with the high-brow look and feel of iPhone hardware. 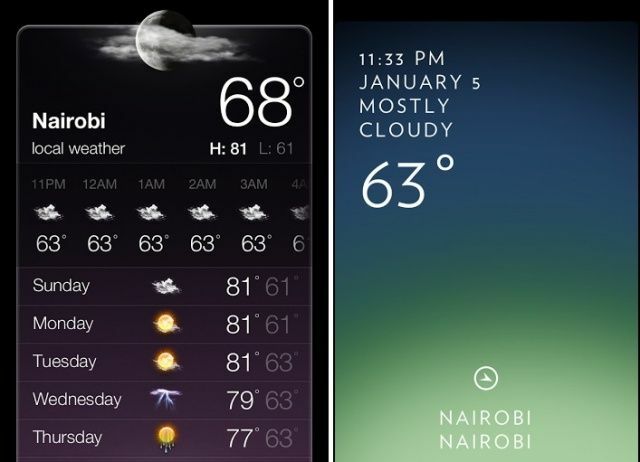 Apple’s fugly Weather app, which fronts for Yahoo’s weather service, could be replace by Hollr’s Solar app. It’s a for-pay app, and Apple should make a deal with Hollr to offer it free to iPhone users. I could go on and on showing how every single Apple app without exception has superior alternatives available. Here’s the most powerful reason why Apple should offer the best third-party apps it can find rather than building its own: Because when you’re using the best apps, you’re using the best phone. By essentially holding an annual contest and handing the winner in each app category massive numbers of users, Apple would strongly incentivize app makers to work even harder and invest even more in the development of iOS apps. And if each new version of the iPhone came with a few new apps by default — rewarding quality upstarts by replacing the old-and-busted with the new hotness — the iPhone would feel fresher and less stale, as it does now. Apple could devote fewer resources to building its expensive-but-mediocre apps, and instead put all their best people on perfecting the operating system. I believe that for many users, the iPhone is the best phone. And I also believe that the very best apps tend to be on the iOS platform. However, Apple is stubbornly failing to capitalize on these two facts, allowing the industry to believe that the iPhone is both staler than and inferior to Android phones. All they have to do is showcase the very best third-party apps on every new phone instead of their own boring and mediocre apps, and that would transform the experience of using the iPhone for the vast majority of users who never replace the apps that come by default on iPhones.